Lock in a great price for Olive Green Hotel – rated 9.5 by recent guests! The room was very clean and comfortable. It was cleaned and spotless everyday. The bed was very comfortable, and the room was of a decent size (they gave us a bigger room than what we initially booked, so very cool). The room controls on the tablet was also a cool modern touch. The phone one can take while in the city, we did not use, but we can see how helpful that can be to non-Europeans! Breakfast was a great selection of warm and cold dishes! I loved that eggs were prepared fresh and in different ways. Definitely one of the better breakfasts we have had in hotels in Greece. Staff were friendly from check-in to check-out. You also can't beat the location----2 min walk from the main road of the inner/old town, the archaelogical museum, and the main transport hub. Also just a 5 min walk to the sea. Lots of great coffeshops, bakeries, restaurants, shopping options, and supermarkets in the vicinity. Staff was friendly and helpful. The bed was comfortable. I would definitely recommend Olive Green as a great place to stay. The best thing to say was the whole place was amazing! We will stay there again and most definitely recommend it to anybody! Position, staff, room, breakfast, everything perfect. The hotel location was great, and the staff was very helpful, with one exception. I tried to get a plastic wine glass from the pool bar, as we had purchased several bottles of wine, but was told they would not provide them as they sold wine in the pool area. I would of payed a corking fee. The Olive Green has an airy, calm and modern feel which provides a relief from the sometimes hectic nature of Heraklion. The staff are friendly and the ability to be able to sit across the street in the square and be served by its restaurant and bar is very nice. Breakfast was of a very good quality, especially the pancakes. 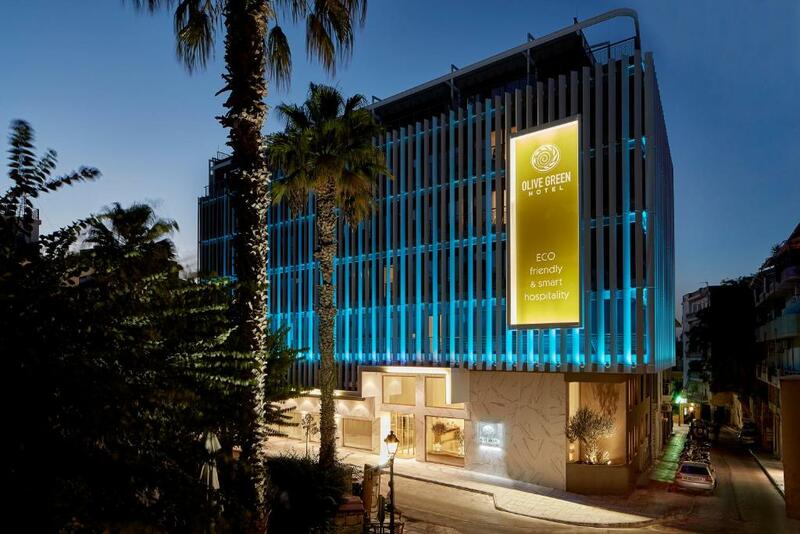 Olive Green Hotel This rating is a reflection of how the property compares to the industry standard when it comes to price, facilities and services available. It's based on a self-evaluation by the property. Use this rating to help choose your stay! 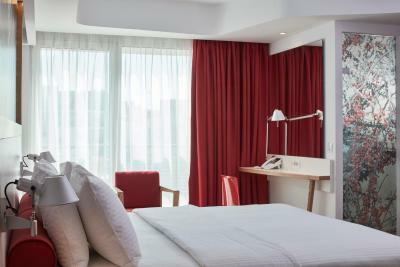 Every room at this hotel combines contemporary living and sophisticated design with modern facilities such as individually controlled air conditioning, a flat-screen smart TV with satellite channels, led lighting, multi and USB plugs, a 15’’ laptop size safe and a separate glass walk-in XL rain shower. Most rooms have balconies and some have a terrace with elegant outdoor furniture where you can relax. For your comfort, you will also find premium toiletries, in house pillow choice, bathrobes and slippers. A complimentary tablet, serving you as a guest directory and digital concierge, is available in every room. A fine selection of wines and other spirits is served at the bar. 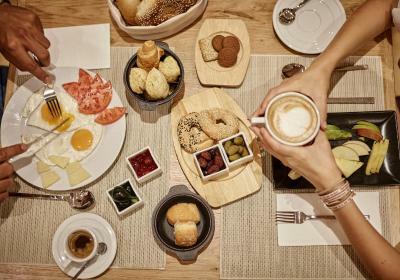 The on-site restaurant offers an abundance of options, ranging from breakfast and brunch to sustainable local gastronomy. Everything Heraklion has to offer lies within a short distance of Olive Green Hotel. Venetian Walls are 2,300 feet from Olive Green Hotel, while The Minoan Palace of Knossos is 3.1 mi away. 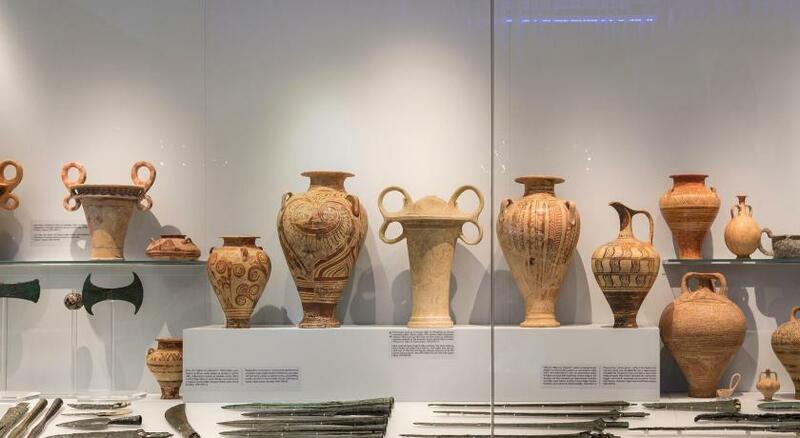 Heraklion Archaeological Museum is just 350 feet away. The nearest airport is Heraklion International Airport, 1.9 mi from Olive Green Hotel. When would you like to stay at Olive Green Hotel? The popular rooms are located on the 1st, 2nd, 3rd or 4th floor. 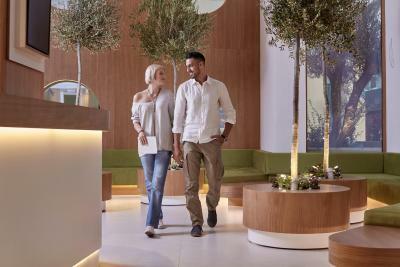 Spacious and minimally decorated, they combine tradition with modernity, offering splendid facilities such as led lighting comfortable beds, balcony, a 32" flat-screen TV, a separate glass walk-in, XL High Pressure Rain shower and a separate toilet. 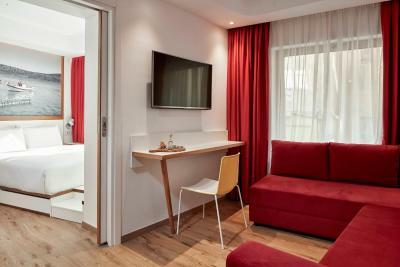 The rooms are also equipped with a 15" electronic laptop-size safe and USB plugs. Free WiFi is available. Please note that rooms on the 1st floor do not open to a balcony. A complimentary tablet, serving you as a guest directory and digital concierge, is available. A handy smartphone for unlimited mobile data and international calls is provided. Urban rooms stretch from 2nd to 5th floor. They are spacious, modern rooms with minimal décor and refined aesthetics. They include high-tech facilities and a 42’’ TV. The rooms come with a glass walk-in, high-pressure rain shower, free WiFi, electronic 15’’ laptop size safe, USB plugs, mini-bar, and tea-and-coffee-making facilities. Located mainly on the 6th floor, Olive Green Club rooms come with cutting edge décor in minimal lines and exquisite architecture. Abundant sunlight brightens the interior, while the terrace is fully furnished, with table, chairs and sun loungers. 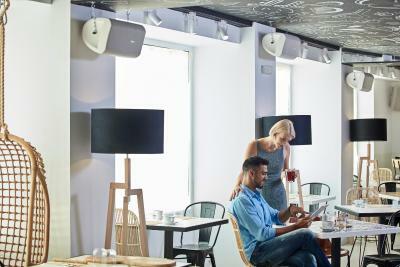 High-tech facilities include a 49’’ TV, walk-in, high-pressure rain shower, an espresso machine, free WiFi, electronic 15’’ laptop size safe and USB plugs. Tea/coffee making facilities are also provided. Guests are welcomed with raki drink, rusks, olives and local sweets. Popular triple rooms are located from second to fifth floor. 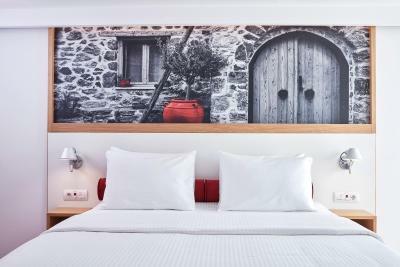 They are modern in style and boast minimal décor with wide, vividly colored pictures of Crete. In each room, there is a walk-in High pressure rain fall shower and 32’’ TV. High tech facilities allow you to explore Crete and provide great convenience. Wood and earthly tones prevail indoors, with abundant sunlight. Urban triple rooms stretch from second to fifth floor. 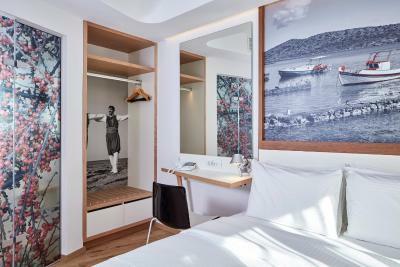 They are modern rooms with minimal décor and refined esthetics, featuring wide pictures of Crete that inspire you throughout your stay. They include high tech facilities and a 42’’TV. The rooms come with a glass walk-in High pressure rain fall shower. They are more spacious than the Popular rooms with a friendly and sophisticated setting. This room type is located on the 1st floor and combines modernity with comfort and unpretentious luxury. The ample open plan design and vivid colors in décor define its interior. The room comes with a double bed and two extra sofa beds. It features wide windows for letting the sunshine in and enjoying the scenic street view. Sophisticated technology is apparent throughout the room, including 2 TVs for the convenience of the whole family. The shower in the room features separate entrances. 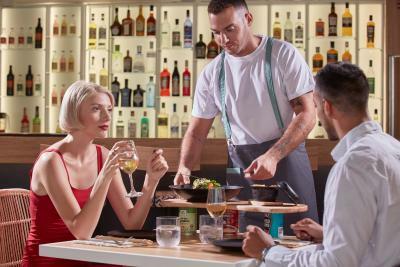 "626 all day cafe restaurant and bar" This is the beating heart of Olive Green Hotel, a special place where sustainable local gastronomy is celebrated. 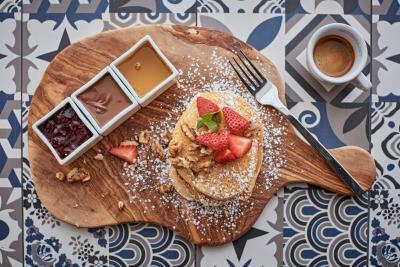 The casual menu offers a wide selection of light snacks, as well as local Cretan cuisine with a twist. Unique culinary creations from talented chef Zinonas Christofidis and his team will surprise your palate in every bite. Be it breakfast a la carte, brunch, lunch or dinner, you will find a variety of fresh, mouth-watering delicacies. Every night, the exquisite bar curator, mixologist and true storyteller Ioannis Korovesis creates magical signature drinks for you. 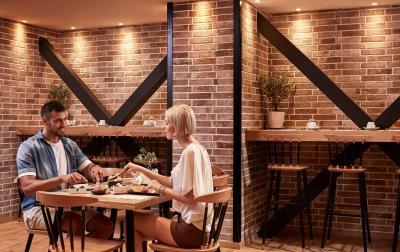 Treat yourself to a wonderful setting with tables laid within a refreshing park. Summer is omnipresent, with the Mediterranean sunshine and the invigorating summer breeze. At frequent intervals, great happenings take place in the all-day café restaurant & bar. House Rules Olive Green Hotel takes special requests – add in the next step! Olive Green Hotel accepts these cards and reserves the right to temporarily hold an amount prior to arrival. The only minor issue we had was with not being able to print our boarding passes using the computer provided by the hotel in the lobby. I don't know what the problem was but the receptionist kindly printed our passes for us using his printer. The hotel is centrally located and in easy walking distance to the two main shopping streets and lots of restaurants. It was a 10-15 minute walk to the bus station where there are buses to Knossos and the airport. I liked the Scandinavian minimalist feel to the room. It was very comfortable and the balcony was accessible. The shower was one of the best I've experienced at a hotel. The only thing that annoyed me was being charged 4.50 Euro for chips. There was no price list I could see for the mini-bar (which could be my error). It was a little thing. You do get a 10% discount in the restaurant though, which was nice. Great breakfast, perfect centrally located location, comfortable room, bed, shower. Electronics were easily controlled by the free-to-use iPad and the Travel Buddy phone had helpful travel information in it. 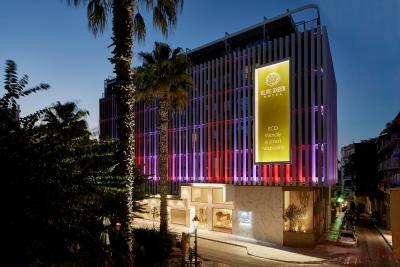 Fantastic hotel in the centre of Heraklion. We travelled with our baby and the facilities were excellent. Clean and modern hotel, superb breakfast, great staff and that for a very low cost. Highly recommended! Coffee delivery has not been so convenient . You had to ask each time for a cup of coffee and for milk . The complementary food products were exposed in the room ( Not packed or protected ). We didn't like the view from the balcony, but it is located in city centre so you don't expect much. We also found the cleaning inadequate as there was some dust on the tea tea utensils and glasses. Lack of ventilation inside the toilet room and the shower room (didn't work properly). Only the fact that I had to leave. Everything. Probably to the top 3 hotels I've ever been. Everything was great - very nice staff, comfortable room, good location and pleasant breakfast. Also convenient restaurant downstairs open 24 hours. 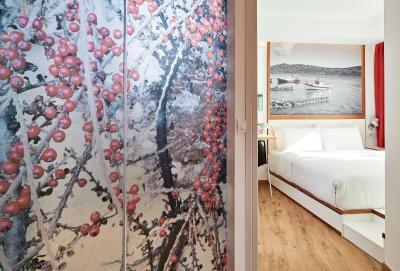 Amazing eco-friendly /green hotel in the heart of Heraklio. The staff is super polite and always there to assist you. Stelios at the front desk and the team at the breakfast were excellent! We will recommend the hotel to our International friends. We will be back soon! Nice to have the phone and tablet in room, but I don't know how that is eco-friendly if they are just draining power. I didn't use them and didn't know they would be there, so it was a nice surprise and good to know for the future so I don't haven't to lug my own. Only trivial things to complain about. Very modern, nice sized room, great shower, perfect central location near a park with views of palm trees, solid breakfast that was nicely presented.